Ideal gift for Housewarming, Birthday, Valentine's Day,Mother's Day and Christmas's Day. ☀INDOOR & OUTDOOR - Multi-role pots are designed to display indoors or outdoors, like bedroom or balcony and patio. ☀BAMBOO TRAY - Set of 4 planters all have bamboo trays, which can hold excess water when you put them on the piano or desk. 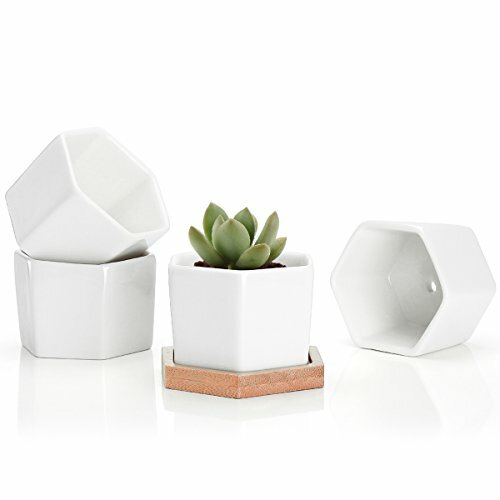 ☀DRAINAGE HOLE - Tiny planters are made of ceramic and have drainage holes in the bottom. ☀DURABLE - These plant pots are made of porcelain(high kaolin), high quality and thick, which can be delivered safely to you.